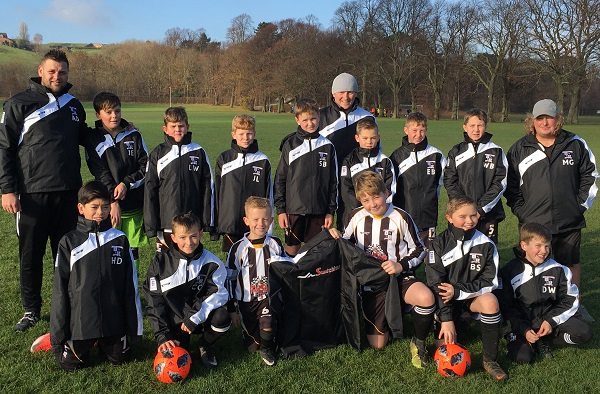 Please see all our catalogues below, a copy of the catalogues can be downloaded. To request a copy of the catalogue, please tick which catalogues you want and fill in the form below to enable us to send you a copy by post. 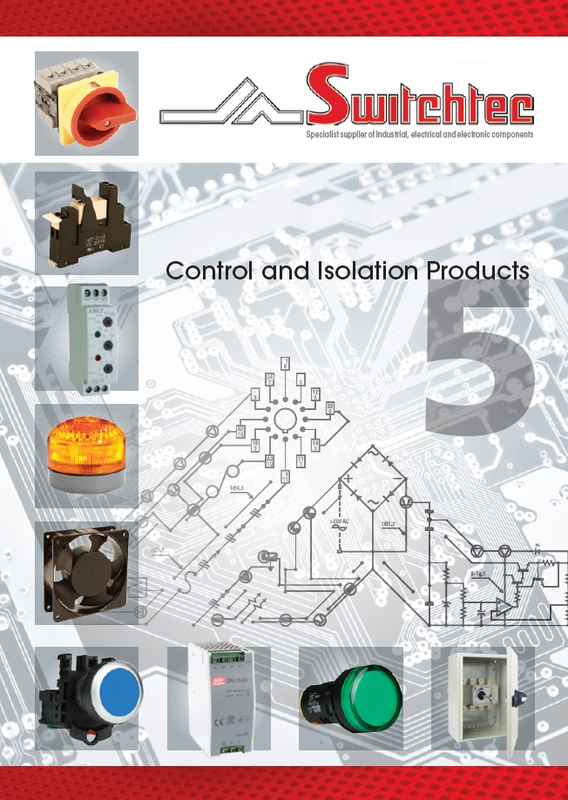 Switchtec’s Control & Isolation Brochure No 5, is the latest version of the popular Control & Isolation Series which details Switchtec’s more popular Panel Builder and system integrator products. 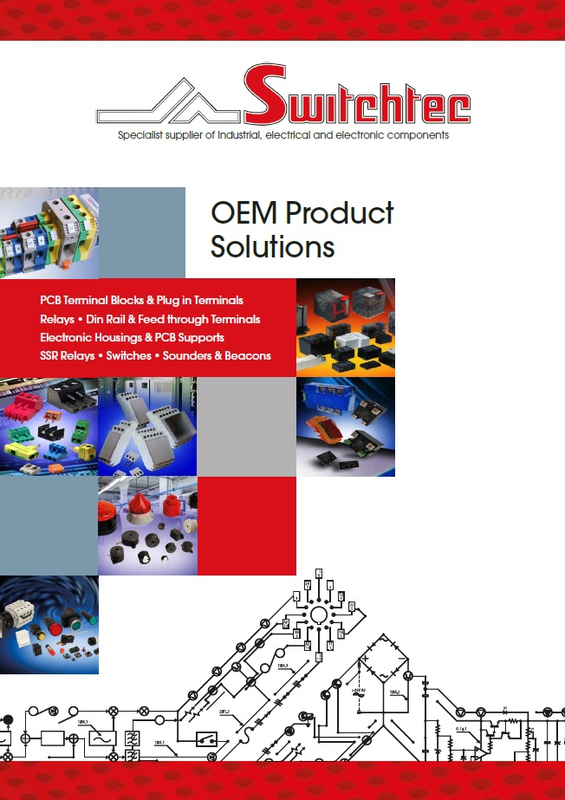 The 16 page brochure includes products such as Plug in Relays and Relay Interface Modules, Timers, Power Supplies, Transformers, Alarms & Beacons, Push Buttons, Isolators, Changeover Switches & Switch Fuses, & Panel Ventilation equipment. 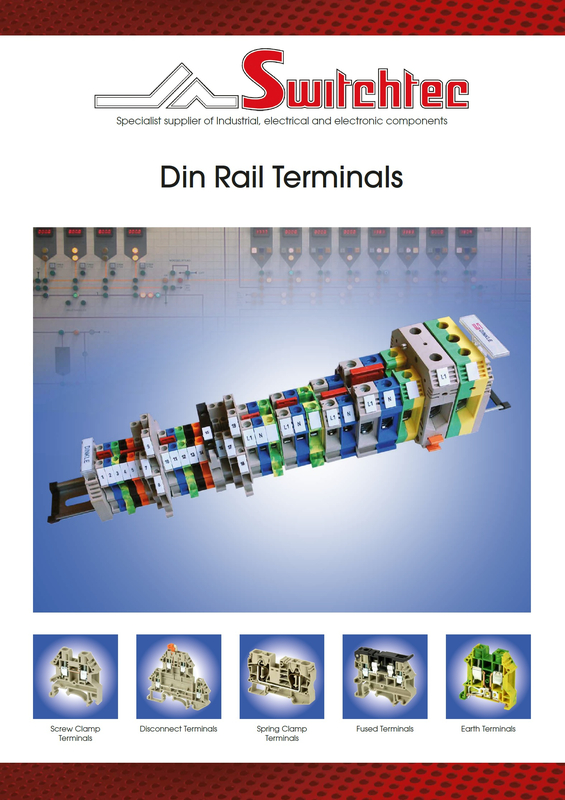 Switchtec’s Din Rail Terminal Brochure is a 12 page brochure dedicated to the Dinkle range of Din rail terminals. This popular range includes Screw Clamp, Disconnect, Spring Clamp, Fused and Earth terminals and their accessories. 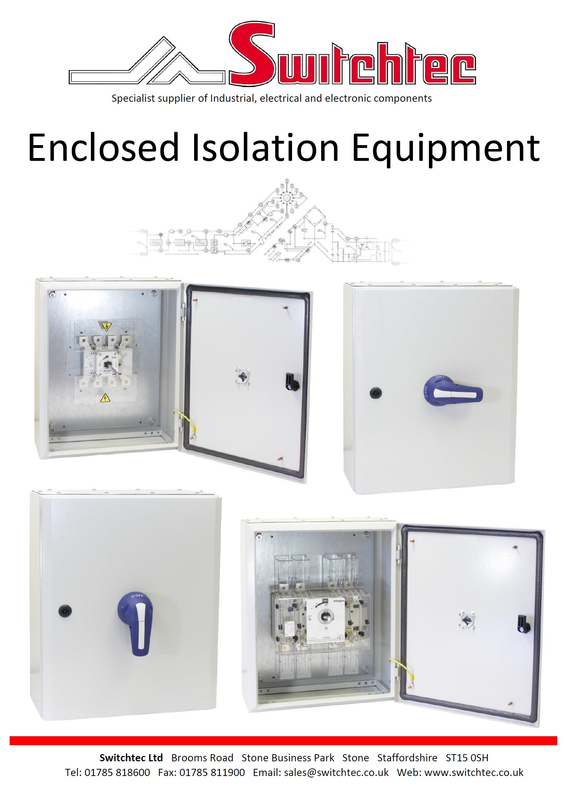 Switchtec’s Enclosed Isolation equipment brochure is a 4 page brochure which details our range of Metal enclosed Isolators, Switch Disconnectors, Switch Fuses and Changeover Switches. 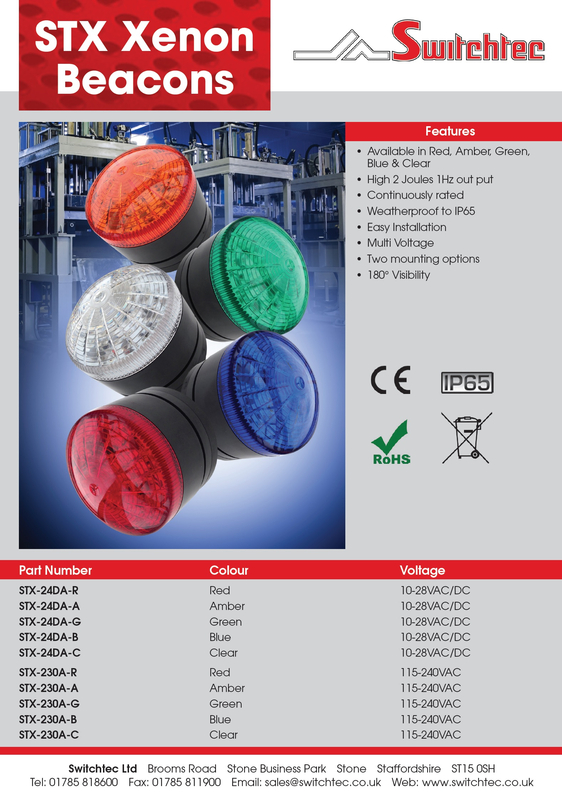 This datasheet includes details the popular range of iSeries Pushbuttons, with information on the Metal Bezel pushbuttons, Selector Switches and Emergency Stop buttons along with their accessories. Also detailed is the iSeries Pushbutton stations including Emergency Stop Station, Single, double and Triple push button stations. 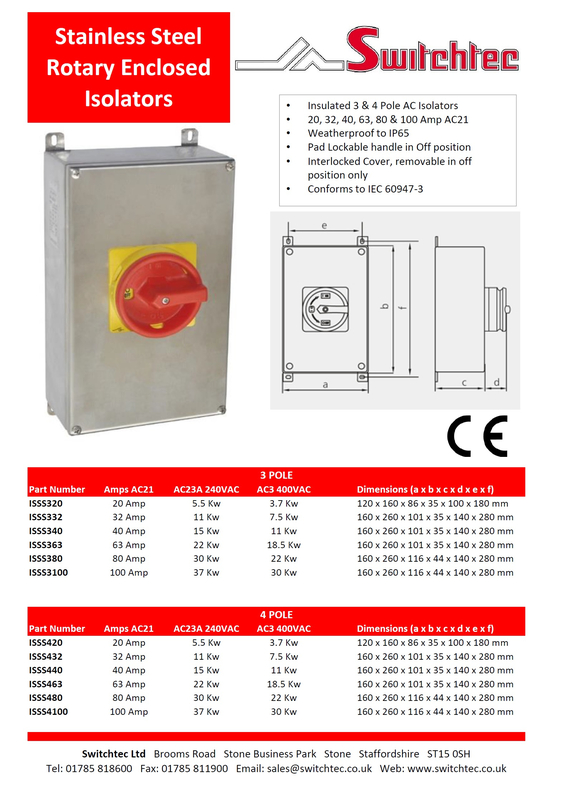 This datasheet details the SCL IP65 Stainless steel enclosed Isolators available in 3 & 4 Pole from 20 to 100A. 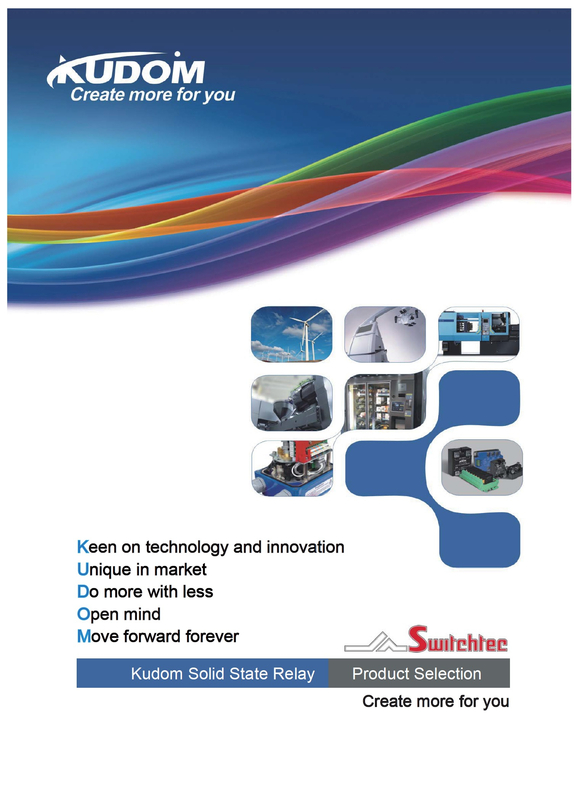 This 24 Page catalogue is an overview of the complete range of Solid State relays from Kudom. 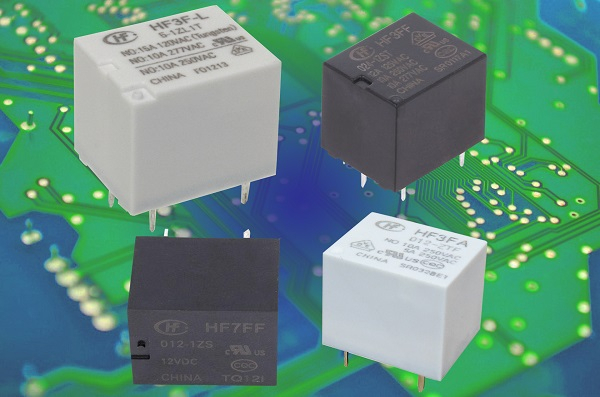 Included is the popular Surface mount SSR’s in Single and 3 Phase, Motor Control Relays, SSR Relay interface modules, PCB SSR’s, Heatsinks and mounting accessories. 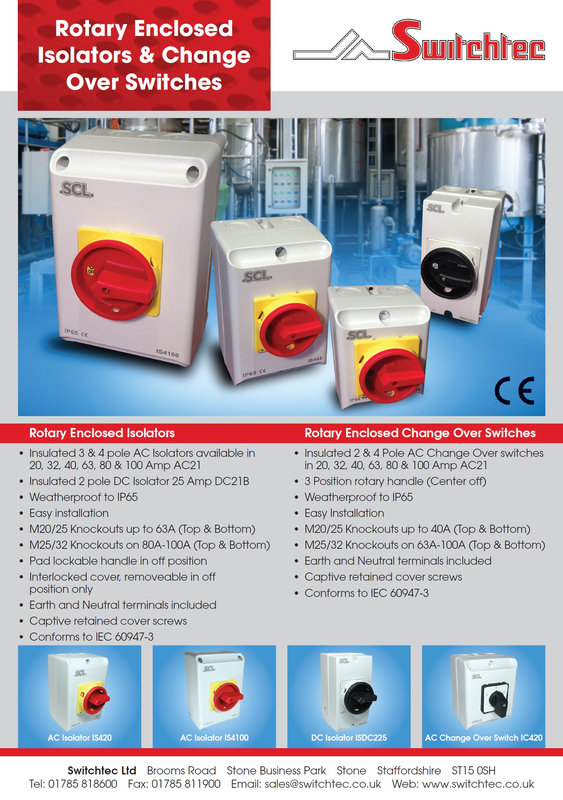 This Datasheet details the SCL range of IP65 Enclosed Rotary Isolators & Change over Switches. The Isolators detailed are 3 & 4 Pole and the Changeover Switches are available in 2, 3 & 4 Pole both rated from 20 to 100A. Also included is the 25A SCL 2 Pole DC Isolator ISDC225. A datasheet outlining the performance characteristics of this popular 2 Pole Latching Relay, available in 12 & 24VDC, 24, 110 & 230VAC. 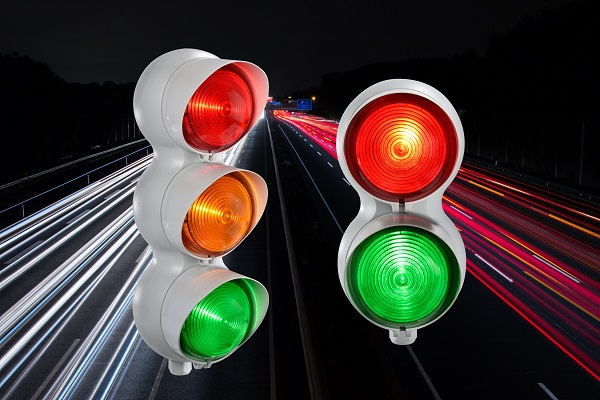 This datasheet includes information on the SCL STX series of Xenon Beacons, available in 2 multi voltage types 24DA (10-28VAC/DC) and 230A (115-240VAC) in colours Red, Amber, Green, Blue and Clear. The datasheet also included the ranges performance characteristics & Dimensional and installation details. This 6 Page brochure details some of the SPD products from Citel. 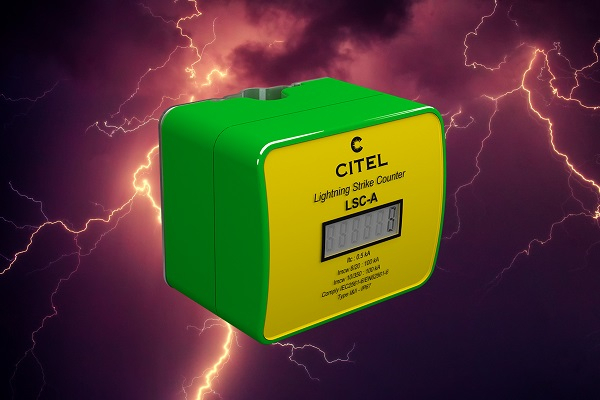 These products, carefully selected by Switchtec, reflect some of the more commonly used SPD’s in the UK, but represent just a fraction of the product available from Citel. 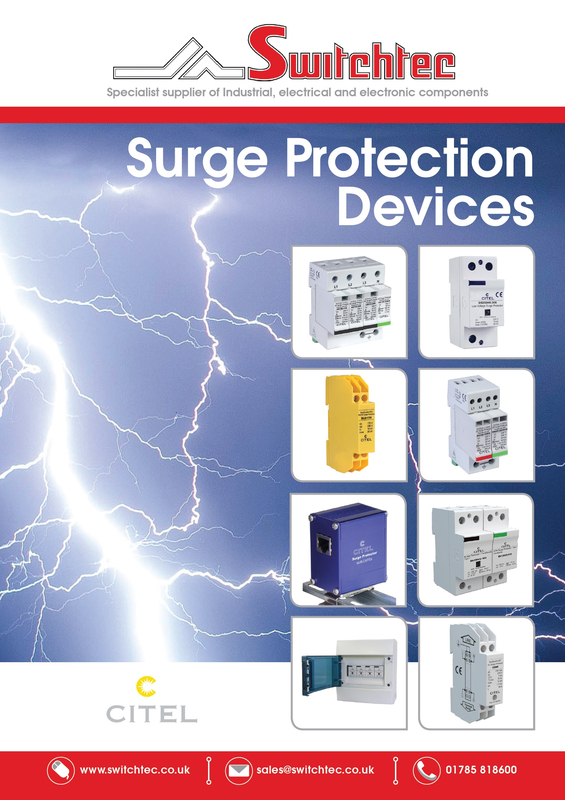 The brochure, as well as being a selection guide, is a source of information on the application of SPD’s, and includes information on risks associated with electrical surges. 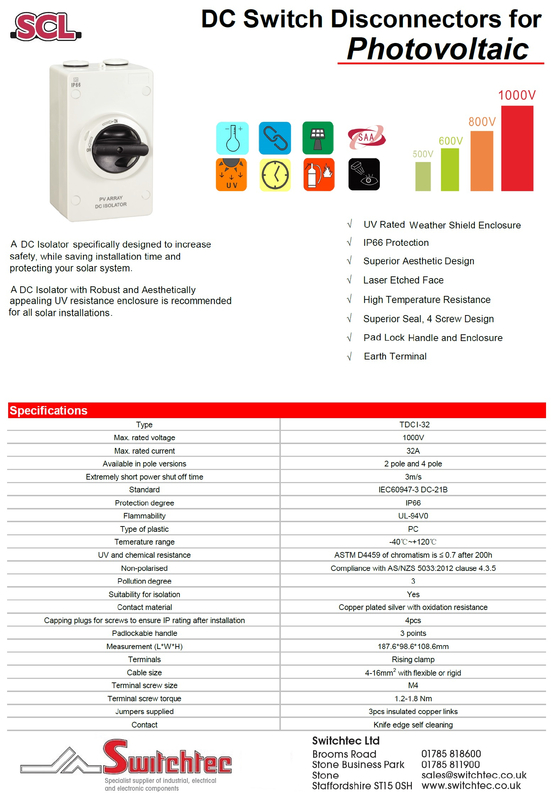 This datasheet details information on the SCL IP66 Enclosed True DC Isolator. The 2 Pole TDCI-32 is rated at 32A up to 1000VDC. The datasheet includes dimensional details, wiring options, installation and ordering information. 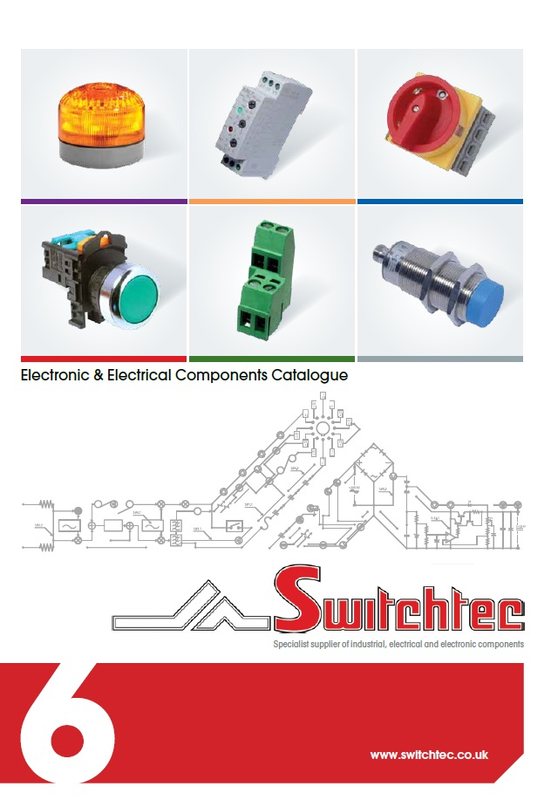 This detailed 312 page catalogue from Switchtec provides information on our range of products from PC Connectors, Control Components, Switchgear, Measurement & Control, Audible & Visual alarms & Sensors. Each product has a complete detailed datasheet and technical specification and includes dimensional drawings. Products included are PCB terminal Blocks, Pushbuttons, Isolators, Timers, Alarms & Beacons and Industrial Sensors. 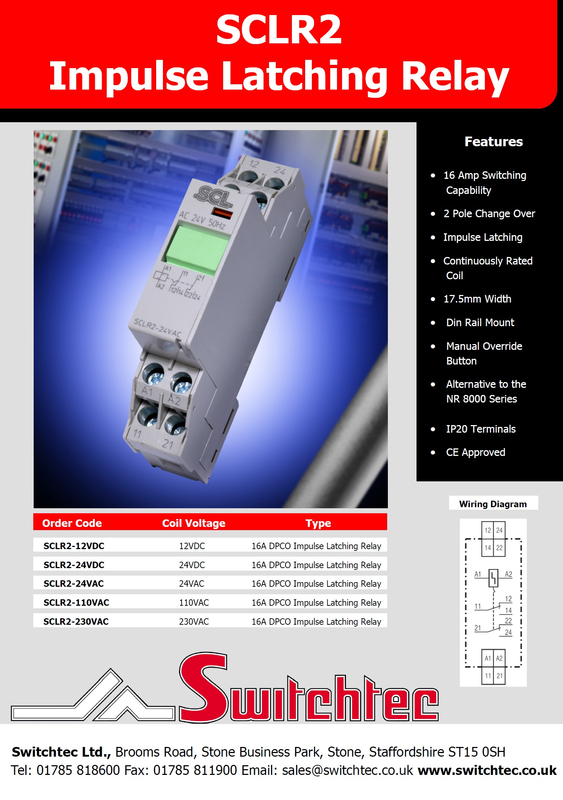 This detailed 260 page catalogue from Switchtec provides information on our range of Relay & Accessories products. Each product has a complete detailed datasheet and technical specification and includes dimensional drawings. Products included are PCB Signal & Power Relays, Industrial Relays, Latching Relays, Automotive Relays and Relay sockets & accessories. 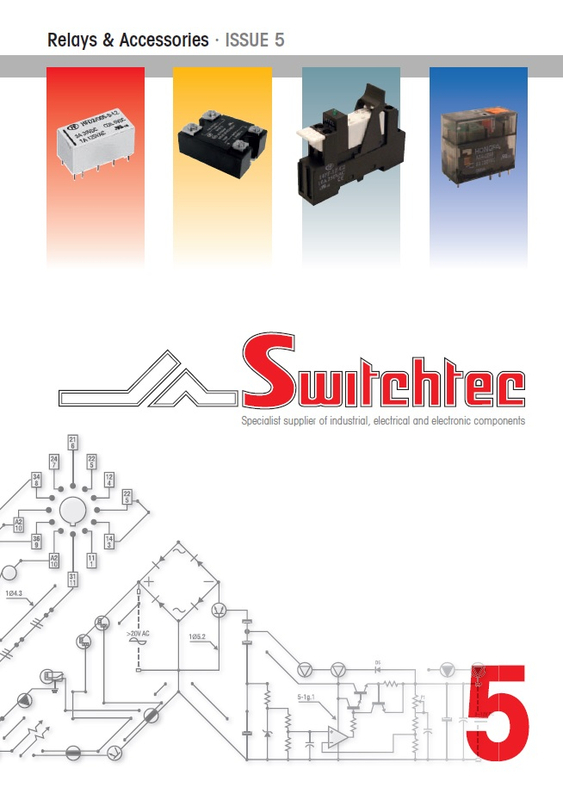 Switchtec OEM products Brochure, please check this.